Molly Jane was born at 2:58 am on April 21, 10 days after her guess date, and after a short, ENJOYABLE birthing time. 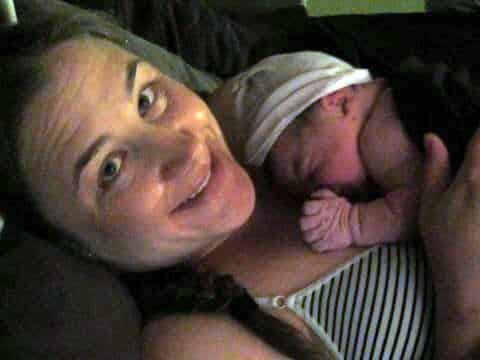 Here’s the story of Molly’s birth (long version). After three weeks of maternity leave and several weeks of preparing our home and TRYING (as best is possible) to prepare our two year old for his new sister, I was starting to get just the slightest bit impatient (though I tried hard not to be!) I had had lots of “toning” contractions in the last weeks of my pregnancy, and I knew when it happened that it would be a quick one! Hypnobabies helped remind me that she would come when she was ready, and that our birth would be a wonderful experience. A little stress heading into my birthing time: both my midwife and my mom were going to be out of town for the weekend (we were just over a week past the guess date at this point). This was a bit stressful for me since we’d planned that my mom would watch our two year old during the birth, and of course I wanted my regular midwife to attend my birth! But no point in allowing too much stress in. We had my dad who could come watch my son if needed and of course the midwife had a back up in place. I think my Hypnobabies training really helped me let go of any stress this situation may have caused, and I felt very sure that things would happen in the exact way they should. And, of course, Molly decided she was ready to be born the very night both my midwife and mom were out of town! Friday afternoon I got my fluid levels checked (41 weeks, 2 days), and all looked good. My husband took the afternoon off, we had lunch and walked a bit. I had been feeling tons of Braxton Hicks that afternoon, but that was normal for me in the last couple weeks, and I didn’t really think it meant anything. I was hoping she would at least wait until the next day when my midwife would be back. We got our son from school, went home and had tons of fun playing in the sprinkler with him. We had our usual “Pizza Friday” dinner and put our son to bed. All along, I had a few Braxton-Hicks here and there, but nothing more than any other evening, so I didn’t think anything of them. I went to bed early, as usual, around 8:30. Read a little, listened to a Hypnobabies track. I woke up to go to the bathroom around 10:45, and felt a pressure wave that felt a little more “real” to me. A little while later I felt another one. At 11:00 I texted my husband (out in the front room watching tv still), “hey, can you come back here, I think my labor is starting.” Of course he ran back, and we discussed our options, waited through a few more waves. Pretty quickly I had the “this is it” feeling, so we called my dad to come over and tried to call the on-call number for the Birth Center. Turns out they were already there for a birth, so they said come on in to be checked, especially since I had a fast birth for my first birth. The car ride was quick and easy, I listened to my Birth Day Affirmations and felt really positive and relaxed. We got to the Birth Center around 12:15 or so, and got to meet the on-call midwife who would be attending our birth. She was really great and warm and funny, which immediately took away any residual stress about our usual midwife being out of town! She checked me, and I was 4cm, around 80%, and -2, which is pretty much where I had been at my appointment on Tuesday. I was told that I could go home and labor some more, or I could stay if I felt like I needed to (incidentally, for my first birth the dr at the hospital told me to go back home when we checked in at 1:30am; I listened to my gut, we stayed, and our son was born 4 hours later!). We chose to stay, walk around a bit, and see where we were in an hour or so. My husband and I went out into the cul-de-sac to walk. We walked and chatted, and I listened to more affirmations. I had more waves as we walked, nothing to regular, and I could still walk and talk through them. But I was still sure our birthing time was close. We went back in around 1:30. 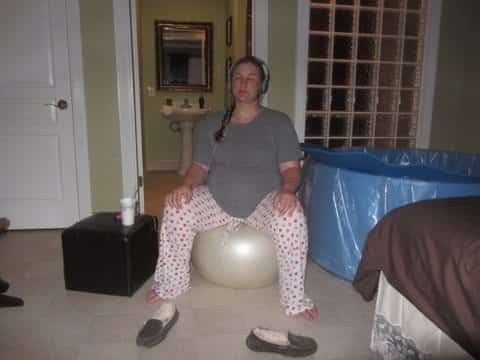 I sat on the birth ball, listened to Easy First Stage, and ate some dried apricots and hydrated myself. I had several more waves while sitting on the ball, and my husband used the “release” cue with his hand on my shoulder to help me relax and breathe through each one. Felt amazing. At this point, they asked about filling the tub, and I wasn’t sure because it still felt so comfortable and I didn’t want to get in too early and slow things down. We decided just to fill it and I’m glad we did. Around 2, my pressure waves picked up, and I began kneeling over the top of the ball while my husband squeezed my hips during each wave, using the “release” and “relax” cues. He was amazing, reading my signals and giving me just what I needed. I also kept repeating “open, open, open”during each wave, which helped me focus on what my body was doing. All through this, the midwife, nurse, and doula were coming in and out to set up and to check on us, but they were really hands off and just let us do our thing, which was just what I needed. Soon I was feeling like it was time to get into the tub. The midwife wanted to check me first, and I was a little discouraged to hear I was “only” at 6 (this was just after 2:30). A few waves later I was in the tub, and it felt amazing! I tried a few different positions to see what felt best, and finished listening to Easy First Stage. My husband wondered what to put on next, and suddenly I felt like he needed to put the Pushing Baby Out track. He put it on but I don’t think I heard a word of it, I was in my “zone” at that point! I was really focused. I flipped onto all fours, which felt the best to me, and about two waves later I felt that urge to push. That was intense, but I knew our baby would be here soon and tried to focus on letting that happen! My husband was right by my head as I leaned over the tub, letting me squeeze his hand (and even bite it through the last intense wave as I pushed her head out!!) I think I pushed through two or three waves, and maybe a few minutes, and then I was holding our little girl!! She had a short cord, and it actually tore as they handed her up to me, so we had to clamp it and get out of the tub right away. Everyone seemed calm about it, so I didn’t stress, just climbed onto the bed and snuggled my baby as they massaged my belly and delivered the placenta. She cuddled a bit skin-to-skin, then she latched right on and nursed really well! I felt amazing, despite missing most of the night’s sleep. We stayed for about 3 and a half hours, and both of us were doing great. We got to go home around 6:30, stopped for breakfast, and were home just about 30 minutes after our 2 year old got up for the day. This was a relief to me, since I really wanted to make the transition as easy for him as we could. We got to introduce our son to his baby sister, which was such a precious moment, and just spend a nice relaxing day at home with our new little family! And this recovery has been SO nice and easy too! I loved our birth, and even feel a little sad it’s over! I can’t say enough great things about Hypnobabies, which helped me stay positive and relaxed and prepared me for a quick and easy birthing time. I also wish more women could have access to the birth center model of care, because it was just fantastic and such a nice way for our baby to be born! !